Jumping Jack is a platform game created by Albert Ball and Stuart C. Ball for the ZX Spectrum 16K in 1983. 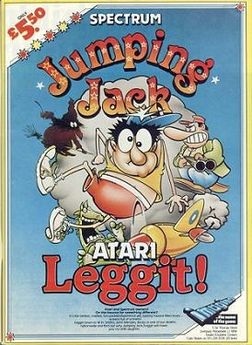 It was available for the Atari 8-bit computers and Dragon 32 under the name Leggit!. On the ZX Spectrum, each level consists of a set of eight wraparound floors, across which holes scroll; when these holes reach the side of the screen, they move up or down to the next floor, depending on if they're scrolling to the left or right, respectively. The goal in each level is to reach the top, by jumping through the holes; however, each time Jack jumps, a new hole is formed on a randomly chosen floor. Falling though a hole or miscalculating a jump and hitting the ceiling temporarily stuns him and leaves him vulnerable to a hole scrolling underneath him; if he falls all the way to the bottom of the level, he loses a life. Completing a level reveals a verse from the "Ballad of Jumping Jack"; the next level features an extra hole at the start and from the second level onward, monsters appear which stun Jack in the same way as a fall or mistimed jump. A game called Jumping Jack was produced by Universal in 1984, but there is little in common between the two titles; while both games are nominally based on navigating "floors", the arcade game is essentially a top-down maze which is viewed from an isometric perspective, rather than a side-view platformer. Also, the arcade game is set in Africa, holes do not appear in the floors when Jack jumps and the level design incorporating far more complex features such as see-saws, which can be used to kill the randomly moving animals which roam the level.